Goodreads: Funny, sad, and irreverent, Hospice Tails shares the stories of pets who traveled to the door of death with their humans. Meet King, an abused pit bull fiercely loyal to his rescuer, Jasper and Jackie, Amazon parrots who sang their person to his final sleep, Washington, a golden retriever who became the only connection to the world for an Alzheimer's patient, and ten other animals who accompanied their beloved people on the hospice journey. Kritters Thoughts: Wow, emotional. Being a pup owner, this story took on a whole different meaning and I became completely entranced by it. Of course as I was reading this gem, my pup, Miss Charlotte was curled up in my lap enjoying an afternoon on the couch with book in hand. 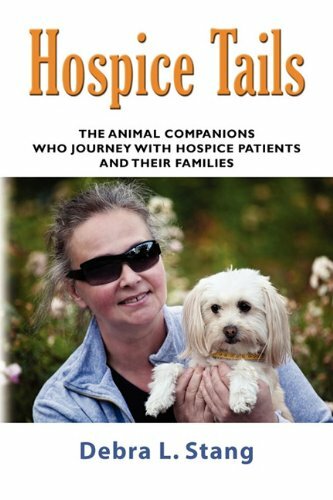 A book full of stories from a hospice nurse when a pet or animal has been involved. Each was unique and fun to read in its own right. From those who couldn't die without being surrounded by their pets to pets that were more of a menace than a comfort - I loved them all. This book made me even more attached to my pup and how much our lives has changed as she has come in and made it her home too. A book that is perfect for those who have a special pet in their lives and love to hear about how a pet can impact each human in the home. Disclosure of Material Connection: I received one copy of this book free of charge from the author and WOW (women on writing). I was not required to write a positive review in exchange for receipt of the book; rather, the opinions expressed in this review are my own. Complete the below form to enter for a giveaway for a signed copy of her book. Glad you liked the book. Seems like a quick read, too.